Stand: Ballard Sport Aircraft Ltd.
Cabin width (at hips): 1,02 m Cabin width (at elbows): 1,17 m Structural gross weight tricycle: 600 kg Structural gross weight on floats: 632 kg Dry empty weight tricycle: [325:340] kg Dry empty weight on floats: [372:386] kg Fuel capacity (2 tanks): 86 litres Never exceed speed Vne: 250 km/h Maximum range @65% no reserve: 1 125 km Rate of climb, sea level: 6,9 m/s Stall speed (flaps up) C.A.S. : 83 km/h Stall speed (flaps down) C.A.S. 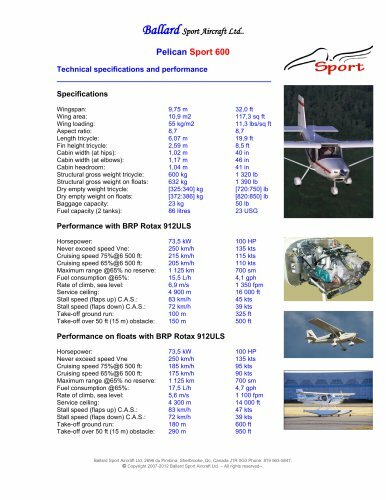 : 72 km/h Take-off over 50 ft (15 m) obstacle: 150 m Performance on floats with BRP Rotax 912ULS Horsepower: 73,5 kW Never exceed speed Vne 250 km/h Maximum range @65% no reserve: 1 125 km Rate of climb, sea level: 5,6 m/s Stall speed (flaps up) C.A.S. : 83 km/h Stall speed (flaps down) C.A.S. : 72 km/h Take-off over 50 ft (15 m) obstacle: 290 m Ballard Sport Aircraft Ltd. 2696 du Pimbina, Sherbrooke, Qc, Canada J1R 0G3 Phone: 819 563-5847. © Copyright 2007-2012 Ballard Sport Aircraft Ltd. - All rights reserved--. Ballard Sport Aircraft Ltd.. ________________________________________________________________ Ballard Sport Aircraft Ltd. Sales: 2696 du Pimbina, Sherbrooke, Qc Canada J1R 0G3 Phone: 819 563-5847 Fax: 819 829-5677 sales@ballardsportaircraft.com Technical support: techsupport@ballardsportaircraft.com Customer service: info@ballardsportaircraft.com Ballard Sport Aircraft Ltd. 2696 du Pimbina, Sherbrooke, Qc, Canada J1R 0G3 Phone: 819 563-5847. © Copyright 2007-2012 Ballard Sport Aircraft Ltd. – All rights reserved--.